Global glass fiber market expected to reach USD 17.04 billion in 2024. The market is anticipated to grow at a CAGR of 7.2% between 2018 and 2024. Glass fiber is the fiber that is widely used in several applications such as transportation, aerospace, marine, wind energy, consumer goods, and others. The report covers forecast and analysis for the glass fiber market on a global and regional level. The study provides historical information for 2015-2017 with a forecast from 2018 to 2024 based on both volume (Kilotons) and revenue (USD Billion). The complete study covers the key drivers and restraints for the glass fiber market. It also provides the impact of the market within the forecast period. Furthermore, the study also includes the opportunities accessible within the glass fiber market on a global level. In order to offer the users of this report, a comprehensive read of the glass fiber market, we have enclosed the detailed value chain analysis. To know the competitive landscape within the market, an analysis of Porter’s Five Forces model for the glass fiber market has additionally been enclosed within the study. The study includes a market attractiveness analysis, where all segments are benchmarked on their market size, rate, and general attractiveness. The study also includes the market share of the key participant’s operating in the glass fiber market across the globe. Besides, the report has covered the strategic development together with acquisitions & mergers, agreements, partnerships, collaborations and joint ventures and regional growth of key players within the market on a regional basis. 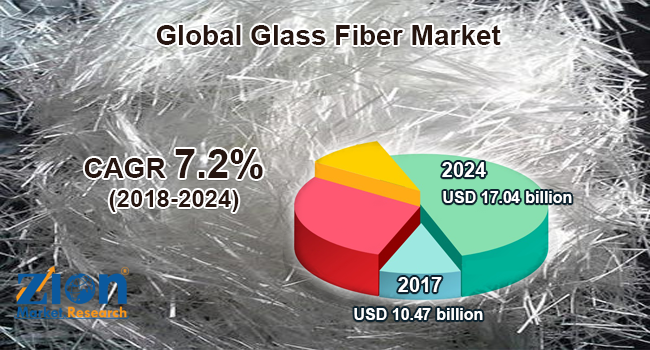 The study provides a crucial view of the glass fiber market by segmenting the market based on its segmentation. The segmentation included product type, manufacturing process, application, and region. All the segments have been analyzed based on present and the future trends and the market is estimated from 2018 to 2024. Based on the product type, the global glass fiber included in this study are multi-end roving, single-end roving, CSM, woven roving, CFM, fabrics, CS, DUCS, and others. Based on the manufacturing process, global glass fiber included in this study are spray up, hand lay-up, pultrusion, prepreg layup, injection molding, resin infusion, compression molding, and others. Based on the application, the global glass fiber included in this study are transportation, marine, pipe & tank, construction, aerospace, electrical & electronics, wind energy, consumer goods, and other applications. Additionally, the regional classification includes the key countries and regions such as Europe, North America, Latin America, Asia Pacific, and the Middle East & Africa. The study provides the exhaustive company profiles of the worldwide market along with the in-depth description of players. Some of the key manufacturers included in the study are BGF Industries, Advanced Glassfiber Yarns LLC, Johns Manville, Nitto Boseki Co. Ltd., Jushi Group Co. Ltd., Chomarat Group, Asahi Glass Company Limited, Owens Corning, Saint-Gobain Vetrotex Taishan Fiberglass Inc., PPG Industries Inc., Nippon Sheet Glass Co. Ltd., Chongqing Polycomp International Corp., Binani 3B-The Fibreglass Company, and Saertex Group, among others.